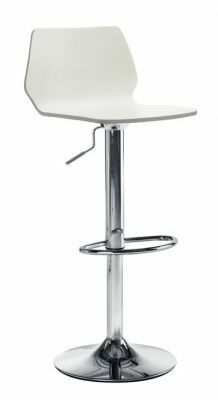 Stylish height adjustable bar stool with a Plywood seat in a White finish. Modern Chrome trumpet base with integral foot rail. Free next day delivery. Ultra modern design bar stool, suitable for many applications, including a home kitchen, or office kitchen space. Includes a stylish chrome pedestal structure and an integral foot rail.